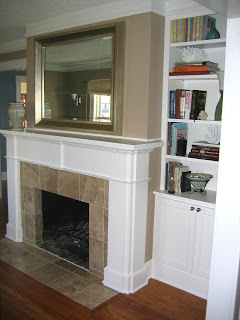 So, this year we have decided to remodel our fireplace–one of the many items on our “house to-do” list (remember we live in a 1925 house). 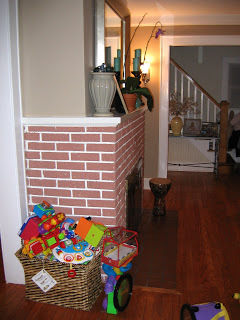 Our brick fireplace was a huge eye soar, and the first thing you saw when you enter into the house. 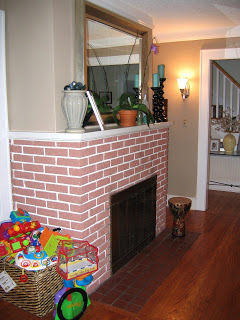 The previous owners thought the fireplace would look better by painting the brick red so it would look more like a brick. I definitely didn’t think it looked very attractive; however, I never saw what it looked like before. 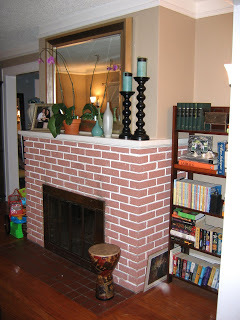 Anyway, our fireplace is completed and it looks awesome! It definitely makes our living room so much better and alive! We had to get it custom made because it’s such a large shape, but I was able to design it how I wanted it. 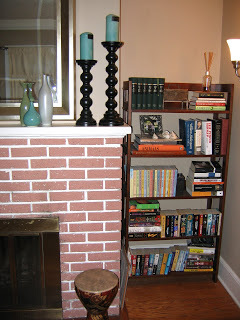 And I had the builder put in built-in shelves so I could hide all our annoying toys. 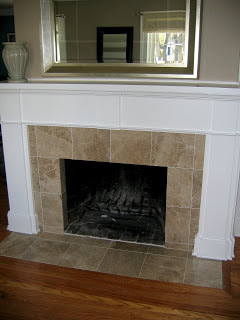 Now I need inspirations for fireplace mantel decor….any suggestions?…..Heidi? 100% better! I love the change. Now all you need are some splashes of color for contrast. I am so happy for you that it is completed. Good luck with re-arranging that furniture in that room. 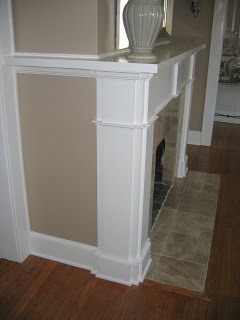 I love the way the fireplace turned out, what a designer!! Gorgeous! What a deal on the marble. 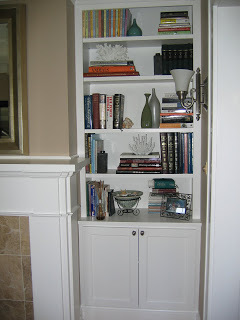 What a beautiful addition to your home!